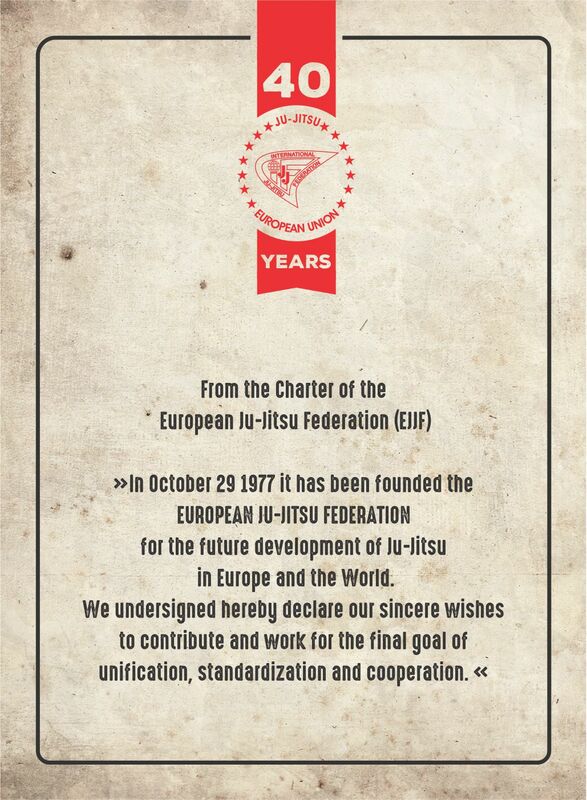 In 1977, following a joint initiative from Germany, Italy and Sweden, the EUROPEAN JU-JITSU FEDERATION (EJJF) was founded. Ten years later in 1987, when all the main European Countries were already members of EJJF the scope of the initiative was expanded to the world-wide scenario. In fact in 1987, the International Assembly founded the INTERNATIONAL JU-JITSU FEDERATION (IJJF) whilst EJJF continued its activity becoming one of Continental Unions within IJJF, as EJJU. After the recognition received by the General Association of International Sports Federations in 1993 and the first participation to world-wide multi-sport event (IWGA 1997), the Ju-Jitsu International General Assembly of 1998, in order to meet some public relations requirements towards further expansion and recognitions, decided to change the name from International Ju-Jitsu Federation (IJJF) to Ju-Jitsu International Federation (JJIF) and EJJF to JJEU – Ju-Jitsu European Union.